Before we use any big, buzz words to explain Roadhouse, let us sum it up for you. We give you the best mattress, a great shower head, a well-designed room with a thoughtful approach to both men and women, a dedicated communal work space, a coffee shop, a health-conscious grab and go market, and a full-service bar and restaurant. And what would Roadhouse be without our beautiful ground floor pool and pool house with games, ping pong, and pool tables (trying to fit the word Pool in 3 times... mission accomplished!). Roadhouse is simply a great place to be. Affordable and convenient: Roadhouse is the hotel for everyone - a community built around its neighborhood with events and social functions for all - from kids to adults. The modern American farmhouse design is reminiscent of simplicity and a return to the roots of hospitality. The comfortable mattresses and soft sheets guarantee a good night’s sleep, and you can rest assured that you will never have to deal with another ugly shower curtain when you stay with us. Just because you are on the road doesn’t mean you can’t feel at home. The restaurant serves healthy, clean food all day and all night with organic ingredients purchased from local farms. You can let your hair down with a variety of craft beers, a delicious cocktail program, and of course wine from all over the world. The restaurant is a component of the ground floor space called Junction - a communal work space, business center, meeting space, market, gym, pool and pool house. Junction is a public space with free high-speed WiFi for hotel guests, travelers, and local residents. Hotels don’t have to feel like hotels. Sleep like you’re at home and live without inconvenience. 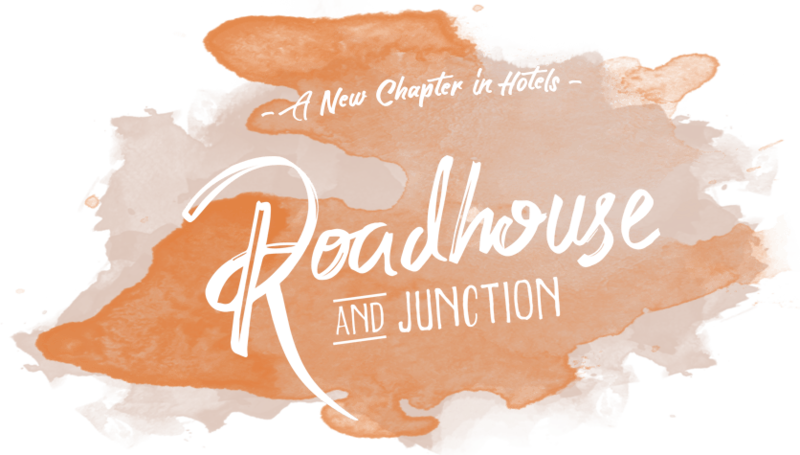 Roadhouse is a new chapter in hotels.